Congress sets the size of the active duty force for each branch of the service and sets the percentage of the enlisted force that is allowed to serve in each pay grade, above the grade of E-4. That means for someone to be promoted to E-5 or above, there must be a vacancy. Such vacancies are created when someone separates, retires, or gets promoted to the next grade. Depending upon the defense budget in a given year, it can be easier or more difficult to join the military or advance in rate. The usual requirements to promotion are a good performer who does his/her job without getting into trouble (work or personal life) and has the Time in Service (TIS) and Time in Grade (TIG). However, with the WAPS and STEP program of the Air Force high performing members can advance quicker than their peers in the same rank, grade, year group. Just like the Army, the unit commander is the promotion authority for promotions to Airman (E-2), Airman First Class (E-3) and Senior Airman (E-4). As long as a person doesn't get into trouble, and does their job satisfactorily, promotions up to E-4 are automatic, based on Time-in-Service (TIS) and Time-in-Grade (TIG). After six months in the Air Force, advancement to E-2 Airman is automatic as long as the member has adjusted well to the Air Force way of life and understands his/her Air Force Occupational Specialty. This six months typically covers the time in Basic Military Training and Technical Training. After ten months as an Airman - a total of 16 months in the Air Force, advancement to E-3 is dependent upon the mastering of the job specialty, setting an example to subordinates, and staying out of trouble (work and personal). Senior Airman (E-4) - 36 months TIS with 20 months TIG, or 28 months TIG, whichever occurs first. Development from a junior enlisted member to becoming a Non-Commissioned Officer (NCO) is the process the advancement process considers when advancing a member to E-4 - Senior Airman. Typically, it takes three years to advance to E-4, but it can be faster depending upon enlistment contract, pre-military college, and other programs. The Air Force offers programs for selected enlisted personnel to enlist at an advanced rank, for things such as college credits or participation in Junior ROTC. The highest advanced rank one can enlist with under these programs is Airman First Class (E-3). The Air Force has a special program where commanders can promote a limited number of outstanding Airman First Class (E-3) to Senior Airman (E-4) six months before they would otherwise be eligible. This program is known as the Senior Airman Below-the-Zone Promotion Program. Primarily, commanders decide who will be promoted under the program by means of a promotion board. Large units (those with 7 or more eligible for promotion) can conduct the promotion boards "in-house" and select up to 15 percent for early promotion. Small units (6 or fewer eligible) are combined into one pool of eligible to form a central base board (CBB). Promotion Fitness Examination (PFE) - This is a 100 question test about Air Force general supervisory subjects, such as history, leadership, NCO responsibilities, first aid, customs, and courtesies, etc. The maximum number of points that can be awarded is 100. Specialty Knowledge Test (SKT) - This is a 100 question test about the individual's job in the Air Force. The maximum number of points that can be achieved from the SKT is 100. Time-in-Grade (TIG) - Air Force members are awarded one-half of a point for each month they have time-in-grade. The maximum number of TIG points is 60. Time-in-Service (TIS) - Members are awarded two points for each year they have in the military. The maximum number of TIS points is 40. TIG and TIS are being phased out or not counted as high with the new changes compared to the above test scores and overall performance and reports. Awards and Decorations - Just like the Army, Air Force members receive promotion points if awarded certain military decorations (medals). The maximum number of decoration points is 25. Enlisted Performance Reports(EPR) - Changes in recent years have been made to this part of the WAPS equation: Only the three most recent EPRs are used in promotion calculations. The WAPS test results are added to the EPRs, service and grade times and decorations, the top 60 percent of applicants within each Air Force specialty code will have their records sent to an evaluation board. In the Air Force, selections for promotions at these ranks are made using a weighted airman promotion system or WAPS. The Air Force is allowed to award five extra percentage points to AFSCs it considers critically-manned. So, if the overall promotion rate for E-5s is 25 percent, the Air Force could promote 30 percent of any AFSC it considers to be seriously undermanned. After the Air Force determines what the promotion-rate is going to be overall, airmen have to be eligible for promotion, based on the skill level they've received in their jobs, TIG/TIS, EPRs, and scores on advancement tests. Skill levels are based on On-the-Job (OJT) training requirements, completion of job-school, and/or completion of a job correspondence course. 1-Level. Untrained. Designates individuals who are in basic training and/or technical school. 3-Level. Apprentice. The 3-skill level is awarded after graduation from technical school. 5-Level. Craftsman. The 5-skill level is awarded after a period of OJT, and completion of CDCs, after arrival at the first duty assignment. While it varies based on the complexity of the job, it takes most people about 18 months to earn their 5-skill level. 7-Level. Supervisor. When a person is promoted to Staff Sergeant (E-5), then enter into 7-level training. This is accomplished via OJT, and (usually) graduation from a 7-level job-school. Sometimes, there is no available job-school, and upgrade is accomplished by completing 7-level CDCs. 9-Level. Manager. Skill-level assigned to E-8s and E-9s. 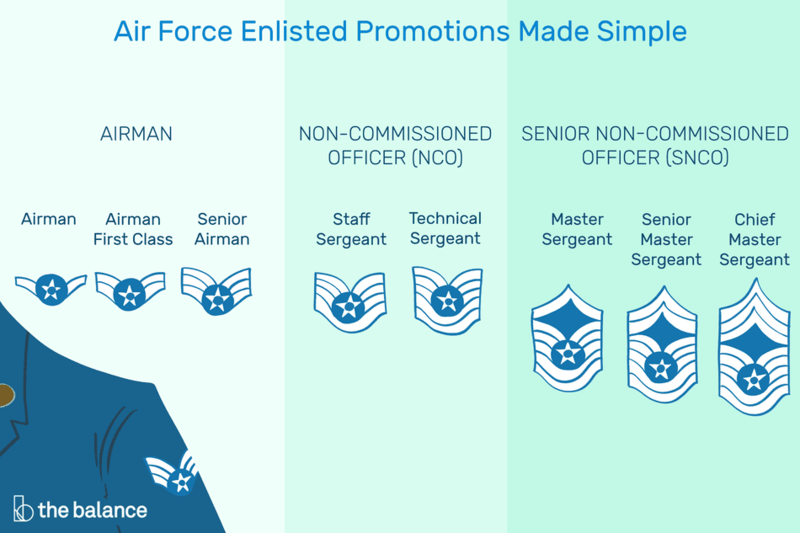 Senior Master Sergeant and Chief Master Sergeant Promotions in the Air Force are made using a combination of WAPS points and a centralized promotion board that reviews the individual promotion record. Only 1% of the Air Force holds the rank of E-9 at any one time, making the process highly competitive. Only 2% of the Air Force hold the rank of E-8. Senior Master Sergeant (E-8) - 11 years TIS and 20 months TIG. Chief Master Sergeant (E-9) - 14 years TIS and 21 months TIG. The WAPS points are the same as used in E-5 through E-7 promotions, except, instead of two promotion tests, there is only one -- The Air Force Supervisory Examination. The test consists of 100 questions and is worth a maximum of 100 points. There is one final avenue for promotion to the ranks of Staff Sergeant (E-5) to Master Sergeant (E-7). Each year, the Air Force releases a limited number of slots for a STEP promotion. The slots are usually distributed to the various major commands, who then distribute them to the wings. There are generally only two or three STEP allocations given to each wing per year. Wing commanders can then use these allocations to promote outstanding individuals to Staff Sergeant, Technical Sergeant, and Master Sergeant. The stated purpose of the STEP system is to allow wing (and above) commanders a method to promote individuals who are outstanding performers but do not score well on promotion tests. However, commanders have wide latitude on when/how to use their specific STEPS allocations. The biggest factor for Senior Master Sergeant and Chief Master Sergeant promotions, however, is the centralized promotion board. Twice per year, the Air Force convenes a promotion board. The board is divided into several panels, with each panel examining the promotion records for specific AFSCs. So everyone eligible for promotion within a given AFSC will have their records scored by the same panel. The board president is always a general officer, and each panel consists of two colonels (O-6), and one Chief Master Sergeant (E-9). The panel examines the promotion records, and score them by considering performance, professional competence, leadership, job responsibility, breadth of experience, specific achievements and education. The maximum number of board points that can be awarded is 450, so you can see that the board is the most significant part of Senior Master Sergeant and Chief Master Sergeant promotions.